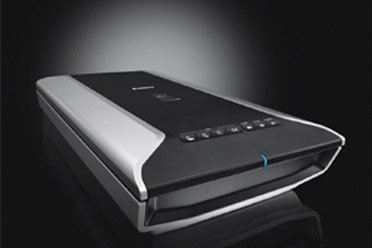 Canon CS5600F color image scanner is high quality 4800 dpi scanner for documents and films. Manufacturer Product Description This is high-performance scanning at its best. The high-luminance white LED lamps use less power and enable scanning immediately after you press the power button. Seven EZ Buttons automate the scanning process - so it's simple to scan, copy and create emails and multi-page PDFs. To make it even easier, the new Auto Scan Mode detects your type of original, then scans and saves it with the optimal settings. How fast? A letter-sized color scan takes only about 11 seconds. 4800 x 9600 dpi for spectacular detail and clarity. Seven EZ Buttons let you do what you want with your original. Thanks to the high luminance white LED light source, the unit is ready to scan whenever you are, with zero warm-up time. Plus, the advanced LED light source quickly switches to standby mode after scanning, saving energy. The CCD scanning element produces high-quality 4800-dpi scans, and is the same CCD technology found in digital cameras. Seven EZ Buttons let you do what you want with your original. So, scan it in color or B&W. Scan and save it, or copy it (sending a scanned image to your printer). Create a PDF of a multi-page original, customize your own settings, or for the ultimate in simplicity, just press the "Scan" button and let the CS5600F take care of everything. Whichever button you press, the process is simple. The new Auto Scan feature makes scanning anything even easier than before. It actually detects the type of original you're scanning - whether it's a photo, business card, personal notebook or form - then automatically scans, processes and saves the image in the appropriate format. All at the press of just one button. The built-in backlight and included film guide let you simultaneously scan up to six negative frames or up to four 35mm slides.